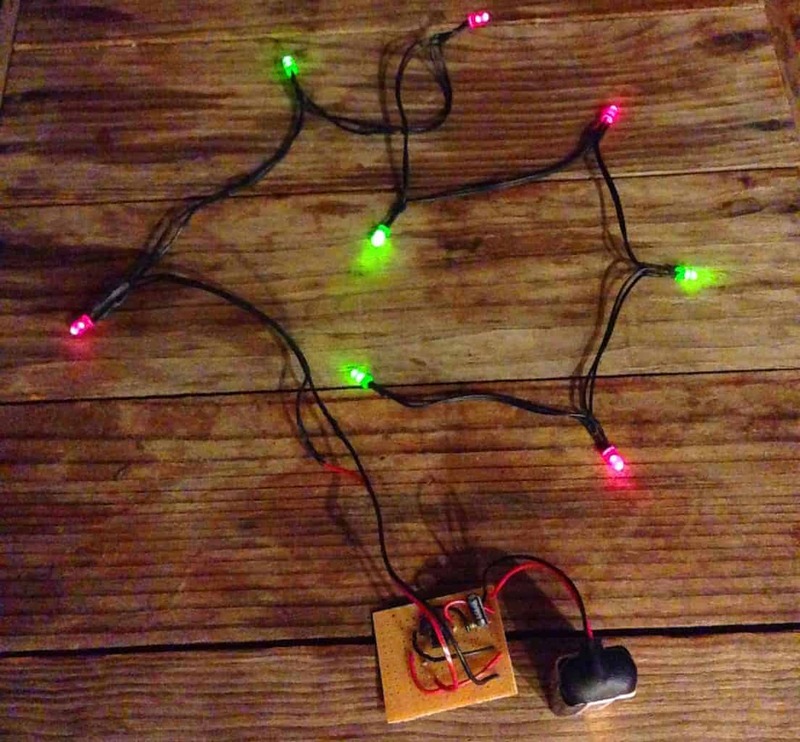 Christmas is coming up, so why not set aside an hour or two to build this blinking Christmas lights circuit? 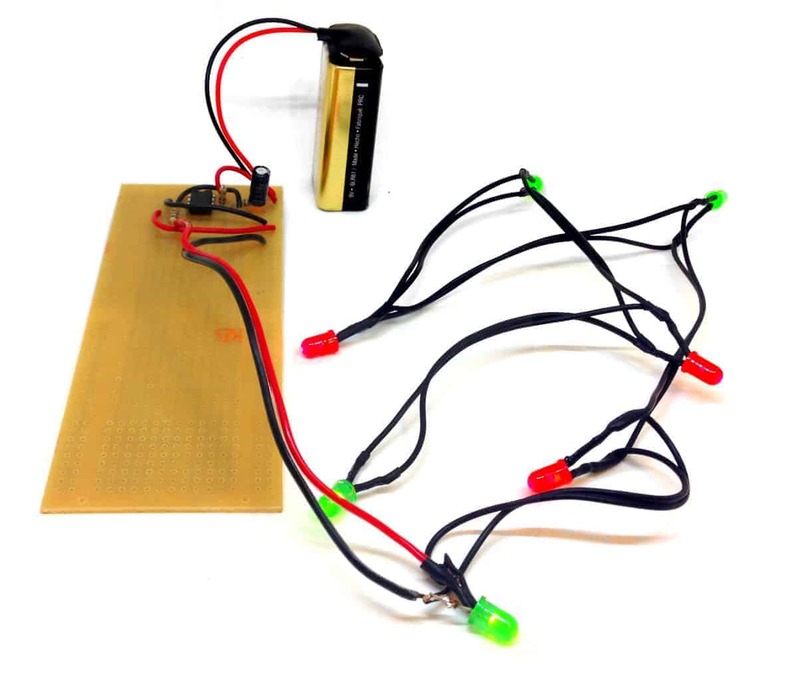 This circuit is easy to build and it’s something you can put to use right away. I built this and hung it in the window, something my girlfriend loved! The blinking part of the circuit is made up of only 4 components. Then you’ll add as many lights as you want. There are several ways to blink lights. 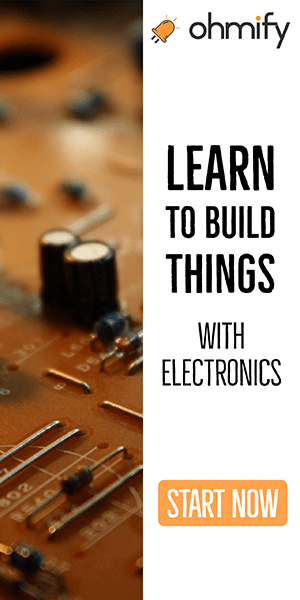 I’ve previously written about how to blink a light using transistors or a relay. Another method is to use a microcontroller. But, I think one of the easiest way, at least in terms of the “easiness” of building the circuit, is using a 555 timer. 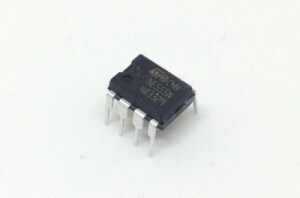 The 555 timer is a chip that you can use for creating a signal that turns on and off repeatedly. That’s exactly what you need for blinking Christmas lights! Just connect this signal to some LEDs and a resistor to control the LED currents. 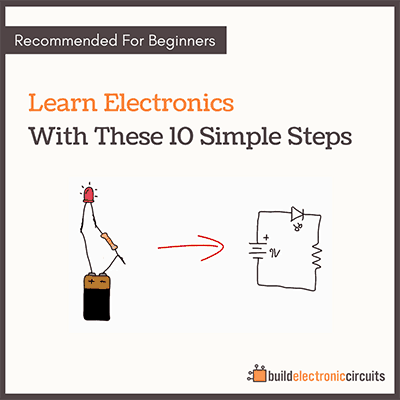 In this circuit you’ll only need 4 components + the LEDs and the resistor. To get the blinking effect, you need to set the 555 Timer in astable mode. Then it’s output will change between 9V and 0V repeatedly. But, an even easier way is to use this calculator. Then you can try with whatever values you have at home and see what result you can expect. With the values I’ve chosen, you should get about 1.5 blinks per second. And the time the LEDs are on should be about the same as the time they are off. When you light up an LED you should always use a resistor, so that you can control how much current that goes through it. 10-15 mA is usually a good current amount for standard output LEDs. In this circuit, you have eight of these in parallel. That means you need 80-120 mA in total for the eight LEDs. Which also means you want this much current to flow through the resistor. The current going through the resistor will be the amount of current that will be shared among the LEDs. If this reasoning does not make sense to you, I recommend you read my article What You Need to Know About Current, Voltage and Resistance. The LEDs I used had a forward voltage of about 2V. So, a 68 Ohm resistor is a good match. You can learn how to calculate the correct resistor value for any LED in my article about current limiting resistors. If you’re thinking about adding more LEDs, keep in mind that the 555 timer only supports around 200 mA of current. For example 20 LEDs with 10 mA. I used a cable from some old headphones to connect the LEDs. Then I used heat shrink tube to cover up the solder joints. If you built this circuit, let me know in the comment field below. Also, any questions about modifications or anything, use the comment field below. Hi Oyvind, thanks for this tutorial. 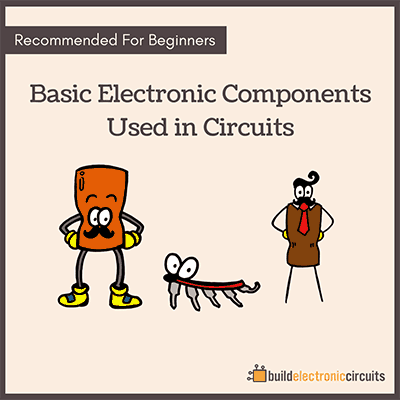 I love the way you explaned things, practically, from the basics, with tools very helpfull (pictures, web sites…, circuit…). Have a nice – blinking – day ! Dear Sir ,, can you please write which power resistor should be chosed for this circuit. You have mentioned just resistance but not power. Does it matters?? Plz help me. 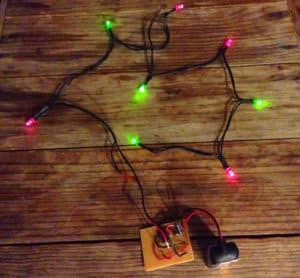 The LED current limiting resistor was determined assuming that all 8 LEDs are connected. If a wire breaks i.e. all 8 are not connected you could destroy those lit. My apologies if I missed this caution. That being said I admire your efforts to educate! Keep up the good work! Do you have a better picture of the breadboard so I can see exactly where all of the components go? This is actually a strip board and not a breadboard. So I’ve soldered the components onto the board (which makes the project more permanent). Can you make it work with one LED? Good article for beginners, thank you! But what about values used in the formula for resistor and capacitor? Were they in kOhms or Ohms and mF or nF? I’ve used online calc you provided – it show absolutely different value. You can see the values in the parts list. kOhms for R1 and R2. µF (microfarad) for the capacitor. It gives you a frequency of 1.462. I just tried the caclulator and got this value. Maybe you used milli instead of micro for the capacitor? Using “http://www.ohmslawcalculator.com/555-astable-calculator” i also got 1.462Hz. But i was using formula you posted “=(1.44)/((10+100*2)*4.7)” and IT gives me “0.001458967” as a result. I’m still new to this and I was wondering how do you determine the resistor values and capacitor value? The LEDs I am using for this have a forward voltage of 3V and I’m still not sure how many LEDs I am going to use. Is there a formula to find the values? For values that set the blinking speed, check the “Setting The Blinking Speed” section in this article. R3 sets the current for the LEDs. Let’s say you want three LEDs. Each LED needs current. How much depends on your LED, but 10mA is normal, so let’s go with this. 3 LEDs with 10 mA is 30 mA. You need 30 mA through the resistor R3. You get 9V out from the 555 Timer. 3V of those 9V will drop over your LEDs. That means you have 6V left to drop over the resistor R3. So you need a resistor of 200 Ohms. I have made the Christmas lights whitout problems and learned from it. I really like your tutorials and clear explanarion. Happy Christmas to you and all the readers. That makes me very happy to hear! This content is really helpful to make such a this type of light, because when we buy it, so its costly and when we make this light by self, it look more beautiful. LED driving voltage ranges depend upon color. These voltage ranges do not necessarily overlap and probably depend upon the manufacturer as well. So if the voltage on a parallel design is too low for some LEDs the higher voltage ones will not light. If driven at the higher voltage, the lower voltage ones quickly burn out. So, you cannot necessarily drive a color mix with the circuit described. One internet source sells a selection of 5 LED colors. The voltage range for yellow and red is 1.8 to 2.3 volts and the range for blue, green and white ones is 2.8 to 3.3 volts. This circuit will not drive a mix of colors drawn from these two groups. 3 led glowing kar sakthe he kya…? Thanks for the circuit! As one of the earlier posts suggests, the LEDs have to be the same colour (or at least similar forward voltage) to work welll. NOW ASSUMING I WANT THE LED S TO BLINK IN A RANDOM ORDER OR OR RISING ORDER CAN I DO IT WITH 555 TIMER AS WELL? For a seemingly random order, you can connect the LEDs like in the above diagram, just mix up the order. Sir. Thanks. Via the blinking formula of d light. Where is the 1.44 coming from ? I am not sure. I’ve never dissected the formula. PlS sir. Can i add R4 to IC pin 3. and add another set of the same LED color to cct. Yes you can. But you can also just change the value of R3 to give you the current that you need for the number of LED you have. Quick question. I’m still a bit new to this but how do you know the limit of LEDs you can use? 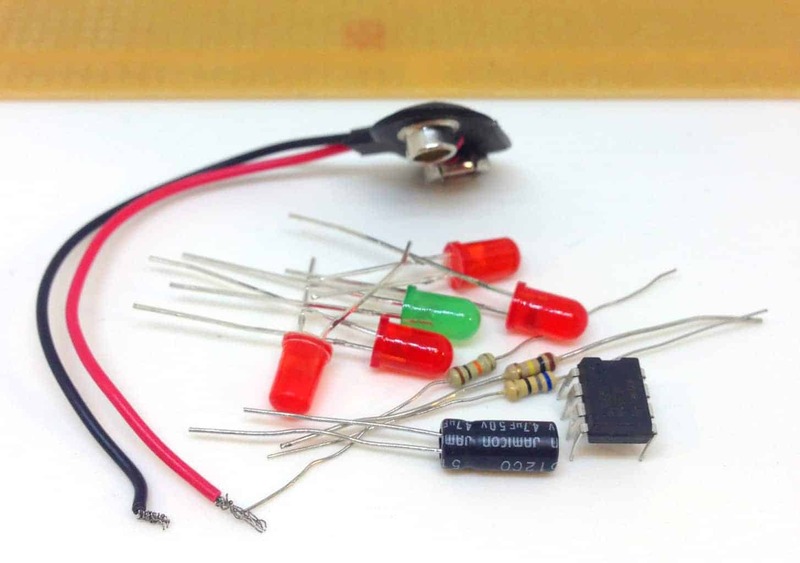 For example, I have 8 LEDs that have 24mA each and I am planning on using a 9V battery. Each has a forward voltage of 3V. So if you want your LEDs to be at maximum brightness, 24mA, you can have 200 divided by 24 LEDs. That’s 8 LEDs. If you run less current through the LEDs, for example only 12mA, you can have 16. Hi.. I have a question.. I bought about 50 green single leds.. Now.. I want to. Connect them to a solar panel.. Kind of like the solar lights… (bare with me on the lingo, I know nothing) I want each led light to be connect to a single wire coming from solar thing.. So. I will have 50 green led lights on the end of 50 separate wires. All ranging from 1ft. To 20ft…but… I want a blinking sequennce to be slow and dimming where each light dims on and off slowly. And almost at differant times.. Please help me.. Thank you in advance. como faço pra colocar 97 lampadas de resistores piscando? I have a question to ask regarding the paragraph 4 in the subtopic 4 “Setting the LED brightness” and that is how did you end up determining the value of limiting resistor as 68 Ohm. As far as I know that you found it for one LED so the current is around 15mA for 1. So, as R= V/I that is 2V/0.015A gives 133.3 ohms. Can you please explain.? Thank you in Advance. Hi, the 2V is what drops over the LED. The rest, 7V, drops over the resistor. So you need to use 7V to calculate the current. There are 8 LEDs, so each led will get about 13 mA. I haven’t. But those bulbs use a lot more current, so you’d probably need to use a transistor that can handle enough current in between the 555 and the lights.